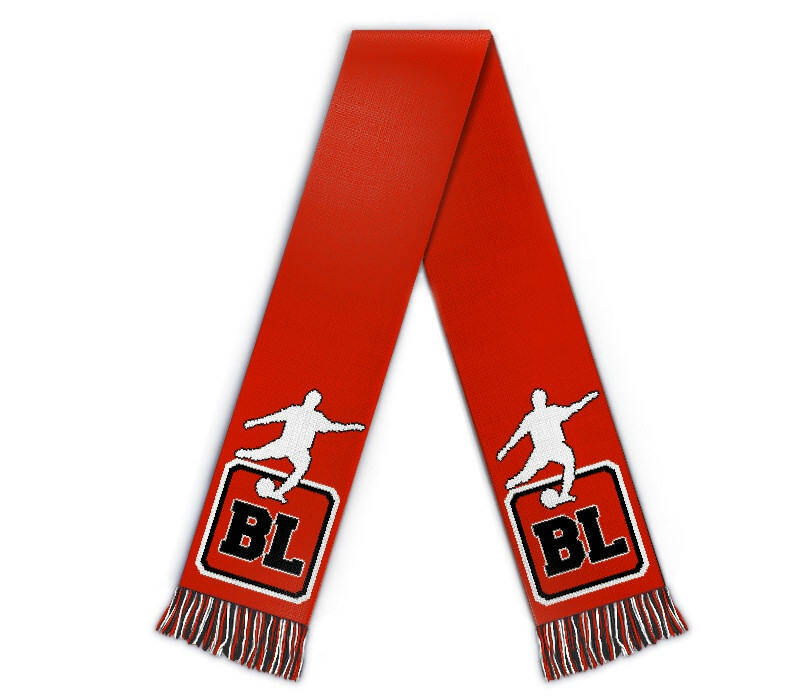 Edit design Football scarf Bundesliga , or create your design from scratch. The bundesliga is the major football league in mainland Europe. Design your German bundesliga scarf with custom design, made to order with you team name and logo. Design is knitted in the scarf, it is NOT printed or embroidered. Direct knit factory production, made in Stuttgart / Germany - WORLDWIDE DELIVERY! Double knit, front/backside can have different design / text / colors, at no extra charge. Only restriction is maximum 5 colors in the whole scarf. Fringes / tassles on both ends, due to the way the scarf is knitted, fringes are always made from ALL colors used in the scarf. Every football scarf is knitted WITH fringes. Fringes are not displayed in the online design, because they cannot be designed independently. Fringes are added automatically in the knitting process. Depending on actual design and number of colors, size of the ready scarf may vary. Use 3 or 4 colors for best results. 5 color scarves usually come out wider and heavier, design may be stretched. Round logos in the design may not be perfectly round in the scarf.